Parker Solar Probe is alive and well after skimming by the sun at just 15 million miles from our star's surface. This is far closer than any spacecraft has ever gone—the previous record was set by Helios B in 1976 and broken by Parker on Oct. 29—and this maneuver has exposed the spacecraft to intense heat and solar radiation in a complex solar wind environment. "Parker Solar Probe was designed to take care of itself and its precious payload during this close approach, with no control from us on Earth—and now we know it succeeded," said Thomas Zurbuchen, associate administrator of NASA's Science Mission Directorate at the agency headquarters in Washington. "Parker is the culmination of six decades of scientific progress. Now, we have realized humanity's first close visit to our star, which will have implications not just here on Earth, but for a deeper understanding of our universe." 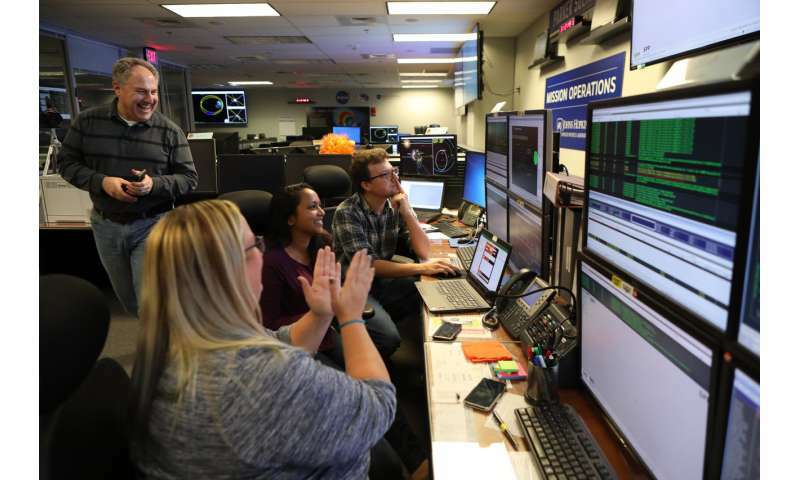 Mission controllers at the Johns Hopkins University Applied Physics Lab received the status beacon from the spacecraft at 4:46 p.m. EST on Nov. 7, 2018. The beacon indicates status "A"—the best of all four possible status signals, meaning that Parker Solar Probe is operating well with all instruments running and collecting science data and, if there were any minor issues, they were resolved autonomously by the spacecraft. At this distance, the intense sunlight heated the sun-facing side of Parker Solar Probe's heat shield, called the Thermal Protection System, to about 820 degrees Fahrenheit. This temperature will climb up to 2,500 F as the spacecraft makes closer approaches to the sun—but all the while, the spacecraft instruments and systems that are protected by the heat shield are generally kept in the mid-80s F.
Well named after probably the most influential scientist studying such things over such a long period. If I had scientific heroes, he would be one, along with Ludwig Biermann and Frank Whipple. And, of course, Darwin. Quite a few others, but they found out the real guts of things. I'm still waiting for any evidence of lightning bolts or plasma thundermugs. Good, the TPS works. We'll be finding out all kinds of stuff about the Sun from this mission. Really love this research. Now if this could be given a plasma drive AND a solar sail to be deployed a distance from the sun, no telling how fast it could go. Say solar sail fabric contains photovoltaic cell array to power plasma drive, and plasma collector since ready suppy of plasma fuel is close at hand...da sun, bro. No tellin' how fast it could go. Just keep orbitin and driven as the mini Boussard collector fuels away and fills tanks or M2P2 subsystem. And here I thought the directors of the Parker Solar Probe were trying to slow it down enough for it to be able to approach the Sun. Close enough to collect a variety of new data. Ossified. all the effort and funding and time working om this project? And you want to turn it into a demolition derby? You 'siriusly need to stop mixing your meds with twelve-packs of lite beers!